Have you ever found yourself standing in the laundry room, rather annoyed by incredible the shrinking and felting qualities of wool, staring down at what sadly used to be, a much, much larger knitted something or other? I have found myself there many times, although in more of a laundry corner than a laundry room, per se, and many of those times, I have been bummed because of shrunken sweaters. Alas, I have a solution! It would of course be most splendid to not shrink the wool sweaters in the first place, but if life hands you shrunken wools, make woolly mittens, I say! Step 2: Place your left hand, palm facing down, on a blank sheet of paper. Trace it with a marker (your hand in a mitten-like position) making sure there is about 1/2 inch space between your skin and the line you drawing. Giving a little extra space will keep your mittens roomy and truer to size. If you trace right up to your hand, you may not care for the smaller result. 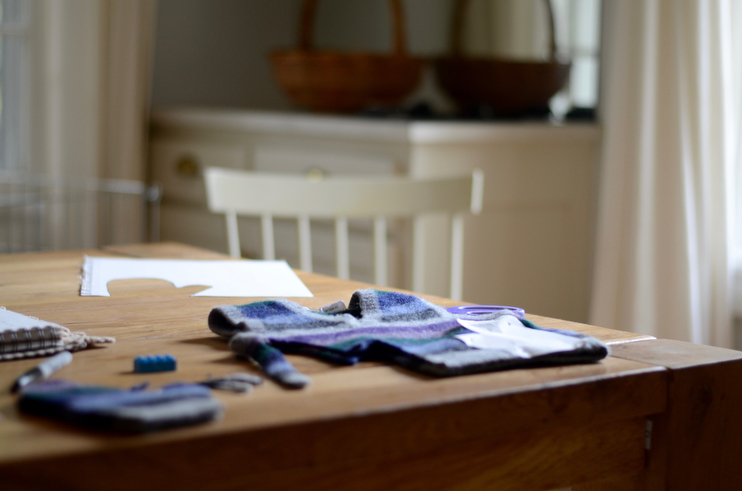 Cut out your traced mitten hand, and continue onto step three. Step 3: Lay your shrunken sweater on a flat surface and make sure the seams are all lined up, especially the bottom lines of the sweater. Lay your hand cut out on the far left side of the sweater so it is nearly, but not exactly, touching the side of the sweater. Pin the hand cut out to the sweater to prevent it from moving when you cut the wool. Note: you will be doing nothing with the arms of the sweater at this point, which is why a vest will work perfectly fine. Step 4: When your paper is pinned to the wool and where you want it, use a very sharp scissors and snip carefully around the hand cut out. You will be cutting through two layers of wool because your sweater is laying flat, so make sure to go slow. After cutting all the way around, remove the pins from your wool, take off the paper hand cut out, and trim and imperfections you see while keeping the set together. It is important that you keep each pair of mittens exactly the same. Step 5: Flip your hand cut out over to the other side, and repeat steps three and four. Once you are finished with this step, you will have four pieces of the same size wool, two per mitten. Step 6: Thread your sewing needle with whichever color thread you’ve chosen, and make a knot in the bottom corner of your mittens. Blanket stitch both pieces of wool together until you’ve reached the other side, and knot it as well. If your thread breaks off or you need another piece, simply knot where you’ve stopped, and continue blanket stitching your way around. Step 7: After your mittens have been blanket stitched, turn them inside out, set them aside, and repeat step 6 with the other pair of mittens. Step 8: Once you’ve stitched your mittens together and have turned them inside out, thread thicker yarn onto large sewing needle with a big eye. 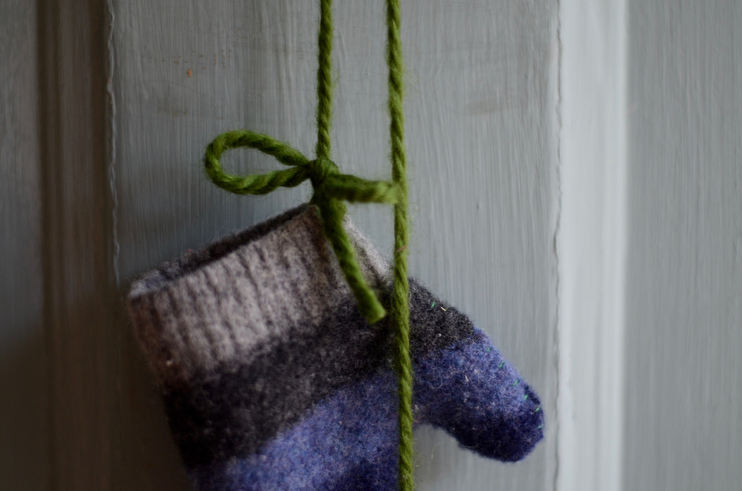 At the inside base of your mittens, thread the yarn through and tie a double-knotted bow. 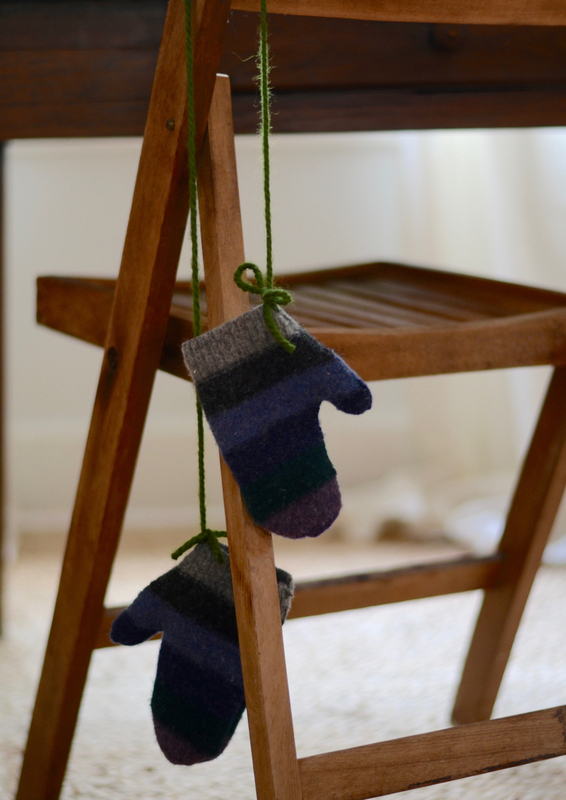 Give about two feet of slack between the mittens, and repeat on the other pair. The piece of yarn string between the mittens does two wonderful things: it keeps you from losing one + it keeps them on better. Tuck the string into your little one’s coat before buttoning or zipping, and that should do it! So how ’bout it these little cuties? I confess, just this morning I dug up a few more shrunken sweaters that I’ll be turning to mittens for myself this week. I have an old L.L Bean sweater I thrifted forever ago that fits weird, most likely due to hot washing, yet I haven’t mustered the energy to donate it. New mittens for meee! And I plan on adding a piece of yarn to keep mine together as well, because I seem to have quite the problem of keeping anything that lives in a pair together. Do you think you’ll give these a try? I do hope so! 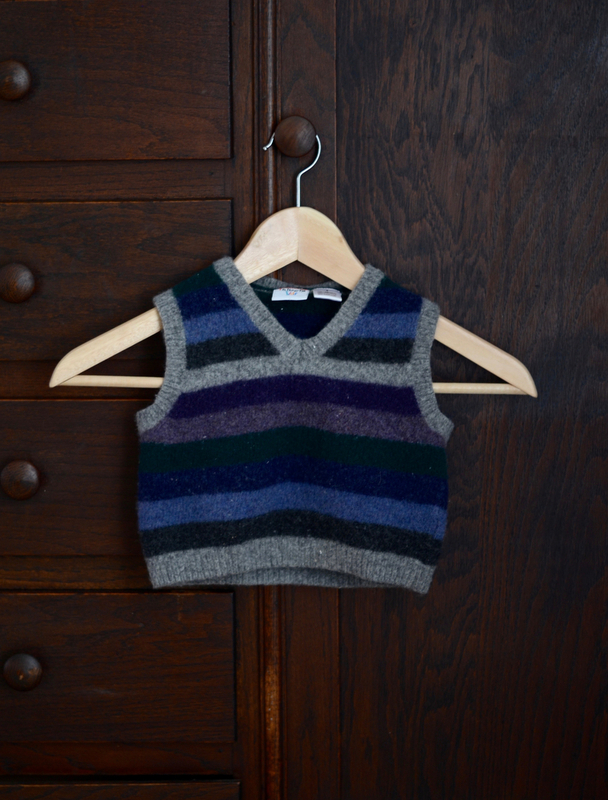 These are so cute, and an excellent solution for the dreaded shrunken sweater situation! As a knitter, my woolens getting shrunk in the wash is about the greatest nightmare I can imagine! It is so heartbreaking. I’m not sure if you know this (and I certainly did not until I became an avid knitter), but wool actually does not need much washing! I do not wash our 100% wool sweaters unless they become physically soiled… which for our adult items might mean they only get washed once a year before they’re packed away for summer! Wool has antimicrobial properties that prevent it from getting stinky, and is naturally self-cleaning. It’s truly the most amazing fiber! But even when it gets dirty, hand-wash only and lay flat to dry is sadly the only truly safe option.